The newest wedding dresses from Jenny by Jenny Yoo for Spring 2019, full of fun and whimsy for spring and summer brides-to-be! We recently showed off the Fall 2018 Jenny by Jenny Yoo Bridal Collection, and now we have the Jenny by Jenny Yoo Spring 2019 Collection for you to enjoy, as promised! 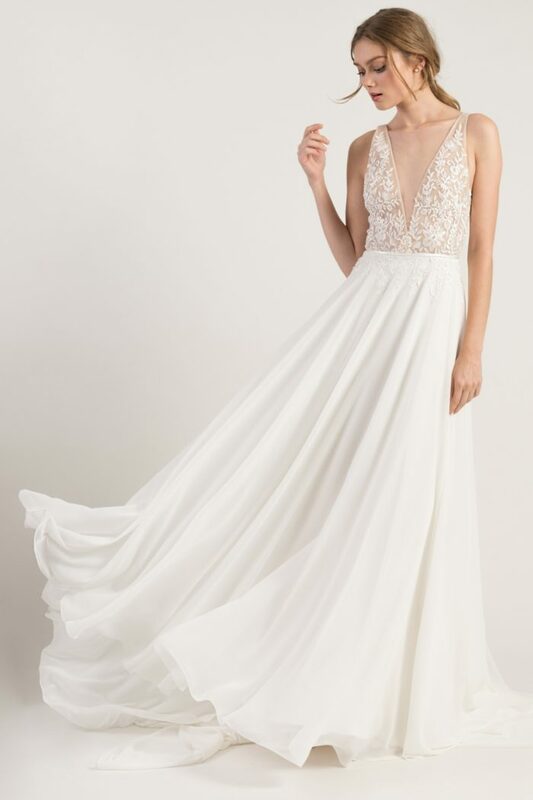 Some of our favorite details include those full tulle skirts, semi-sheer lace bodices, modern minimal styles, and playful touches like pockets, plunging necklines, skirts with slits, and long trains with buttons all the way up the back! 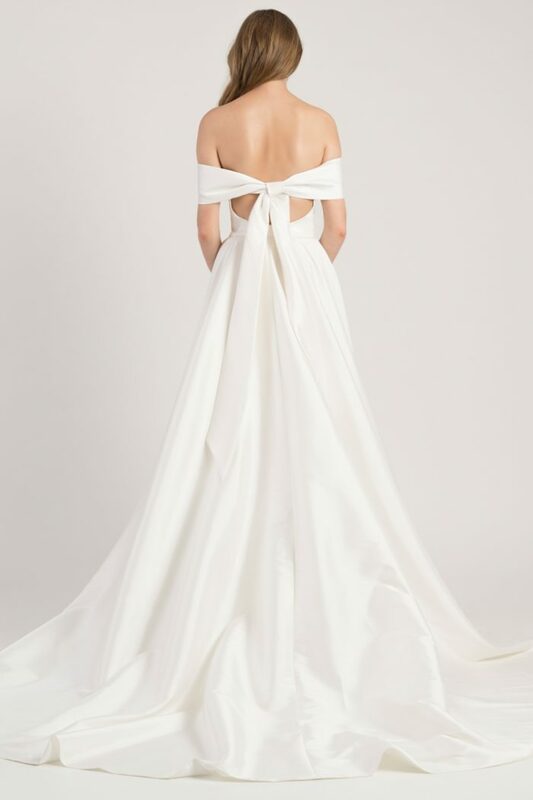 There’s even a sleek high-neck halter gown – Dawson – that reminds us of Meghan Markle’s beloved reception dress! An A-line silhouette spaghetti strap wedding dress with a plunging V neck. The bodice features sparkly beaded lace which flows into a chiffon skirt. A daring leg slit and deep low back adds even more interest. 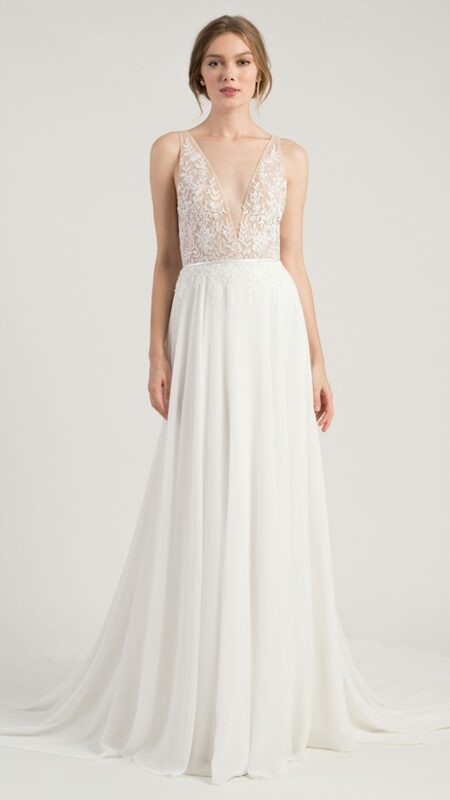 A classic fit and flare sparkly beaded lace gown with a plunging V neck in the front. Sheer illusion panels frame a deep V in the back. 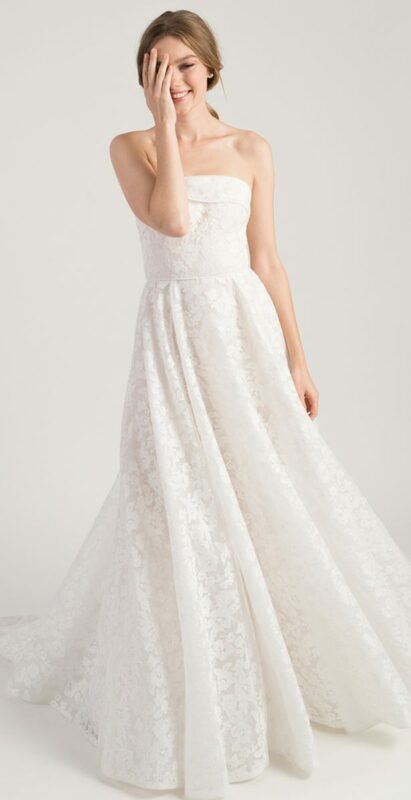 Connor is a classic ball gown wedidng dress in a light and airy organza. A plunging v neck and beaded embroidery adds a hint of sparkle to the semi-sheer bodice. The defined waist and dramatic full skirt with pockets flows into a romantic statement train. 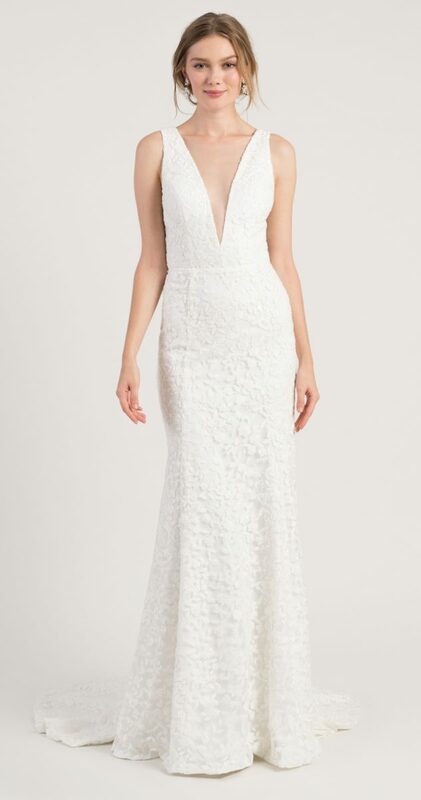 This high neck halter bridal gown, reminds us of the second gown Meghan Markle wore to the reception! 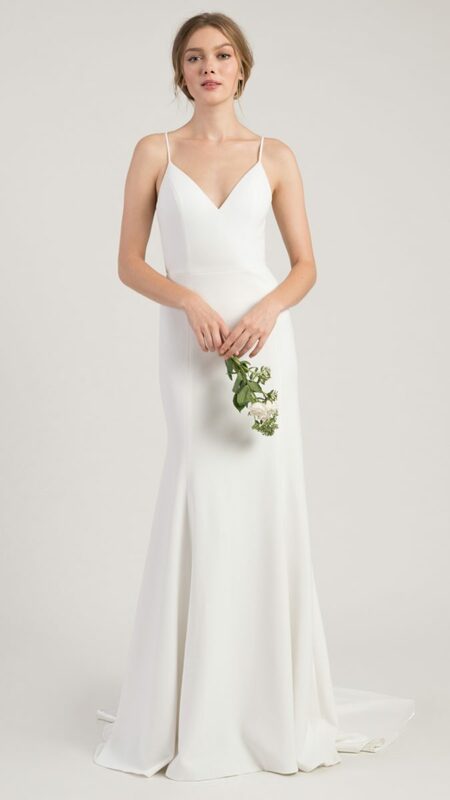 This modern and sleek fit and flare crepe gown is backless and form-fitting with a high halter neckline, and a sweep train. Boatneck illusion neckline wedding dress with illusion open back. 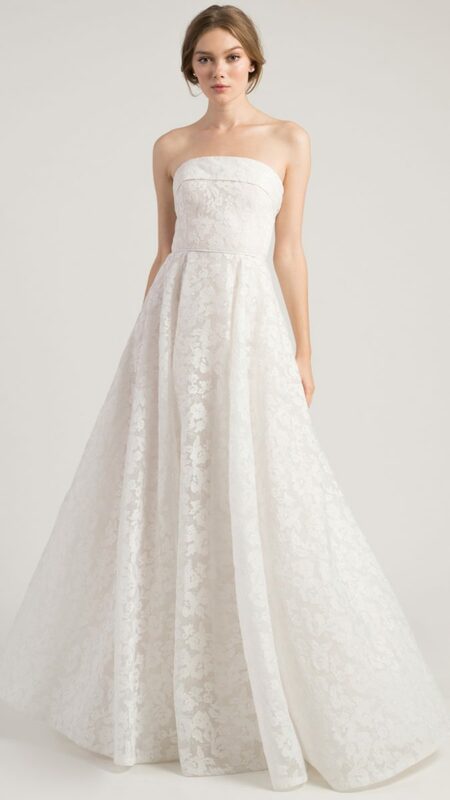 Fit and flare crepe wedding dress with an elegant train. A classic ball gown straight strapless neckline in an embroidered organza. 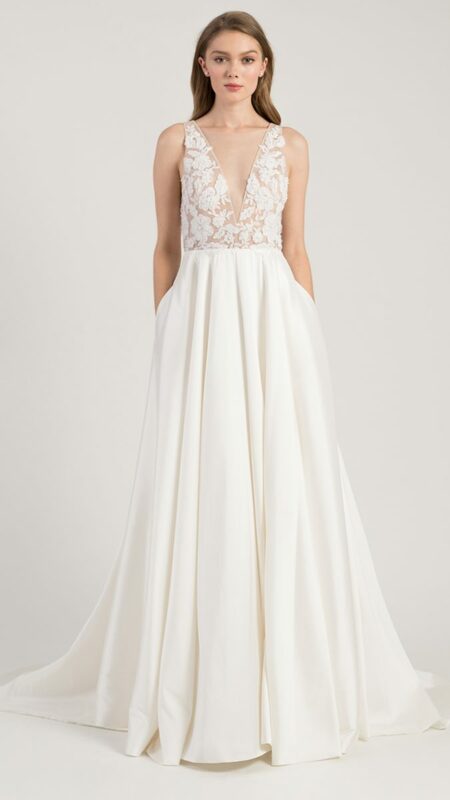 Chiffon bridal gown with an A line silhouette, The plunging v neckline and semi sheer tulle V neck bodice is appliqued with our delicate lace. A romantic circle skirt with a sleek slit and a long flowy train. Minimalist and modern fit and flare silhouette in sleek and fitted crepe. V neckline and spaghetti straps with a captivating open back cut out. Beautiful covered buttons adorn up the back of the gown and train. A-lines. Continuing a long-standing partnership with wedding giant BHLDN* an exclusive curated collection of Jenny by Jenny Yoo gowns will hit all locations in early spring. Each innovative style is inspired by a youthful and sophisticated sweetness brought to life by texture and shape. See more Jenny Yoo including these Jenny Yoo Bridesmaid Dresses, and Jenny Yoo Wedding Dresses, or browse all of the recent wedding dress collections for 2019 that we’ve featured!